Repeated case studies show that data science puts companies at a significant advantage over their less tech-savvy peers. Why, then, are CIOs hesitating to integrate it into their planning strategies? The gap between enthusiasm and adoption is startling. While 80% of C-level executives think data science will be a transformative force for enterprise, only one in ten deliberately use it. 48% describe analytics as critical to the decision-making process, yet a bare 7.4% say they use analytics to guide corporate strategy. What is making otherwise savvy executives disregard their own advice about embracing data science? Some companies are held back from evolution by a sort of “tech inertia”. The analytics infrastructure they have in place is dense, inflexible, and too outdated to allow newer methods to be incorporated without a serious structural overhaul. Changing the existing technology would cause a disruption in productivity while new systems are built. Rather than throw their company into disarray, CIOs push data science to the fringes of their organization. Resistance to change has proven costly. More than half of executives say their analytics infrastructure is too rigid, and 75% say they’ve been unable to fulfill a business request due to that inflexibility. Over time the cost in failed projects surpasses the cost of modernization. Besides the impact on productivity, frustration from dealing with inadequate technology drives the best talent away. It’s a common complaint of the 20% of tech industry employees who are headhunted from their company every year. Solution: If complexity is the concern, start simple. Adopting data science doesn’t have to be a massive undertaking. There are embedded analytics in nearly every piece of enterprise software released in the last few years, so chances are good that your company already has access to some. Einstein Analytics, for example, is incorporated into Salesforce with no need to install components separately. It’s ready to go right out of the box. In order for data to become part of the decision-making process, leaders need to be able to interpret that data. Training takes time, and that’s a precious commodity for executives with heavy workloads. CIOs have historically had trouble convincing their colleagues in the C-Suite to free up time for learning about enterprise analytics. CIOs themselves could use some training. 46% were unsure whether they could interpret results generated by data science. They see the potential but aren’t confident they have the skillset to fully exploit the technology, giving rise to fears that they won’t get a reasonable ROI. Some companies try to entice their staff into doing extended professional development during their personal time. AT&T CEO Randall Stephenson told the New York Times last year, “People who do not spend five to ten hours every week in online learning will obsolete themselves with the technology.” He sweetened the pot for AT&T employees with a generous tuition reimbursement program. Such an approach is unlikely to work for a C-level executive. They often don’t have a spare ten hours a week to devote to study on an ongoing basis. Given a choice between neglecting data science and sacrificing what little downtime they have for the foreseeable future, nearly all executives will choose to keep working with the methods they have. Solution: The priority for CEOs is being able to read analytics results well enough to make data-driven decisions. Instead of pushing for a full analytics course, clear an afternoon to go over a few of the most useful data science techniques with an executive focus. Keep examples in context, show how the techniques translate to actionable advice, and the C-suite will see the value of data science. Regression analysis is a common place to start, and for good reason. It’s a simple concept that can be used to suggest answers to problems or double-check a “gut feeling.” There are levels of complexity, but at its core regression analysis explores the relationship between a dependent variable and one or more independent variables. For example, a manager wondering whether to keep a branch open an hour later could use this method to create a graph of sales volume by hour. If most revenue comes in during the last few hours, that extra hour could translate to a healthy profit. A customized analytics dashboard could also make interpreting data more accessible. These programs pull data from enterprise apps and tools like Safesforce, MailChip, Google Analytics, Github, and more, then present it via a single interface. CIOs can drum up excitement in the technology by soliciting input on the dashboard during the planning phase. Feeling invested in the project increases end user participation rates, raising the likelihood of overall project success. Price isn’t as high on the list of data science barriers as one might expect, but it’s still a major concern. 42% of executives say data science initiatives are too expensive. The cost of the technology itself combined with increased payroll from hiring data scientists looms large in their minds. It doesn’t help that there’s a lot of uncertainty about how much it costs to begin using data science. Price is intensely dependent on a project’s scope; one company might spend a million dollars while another invests only $10,000. Solution: Price is the easiest problem to address. Companies no longer need to invest in racks of servers and space to put them in. These days most analytics are done in the cloud. It’s cheap, fast, and suitable for rapid scaling. Better yet, they’re typically offered as a subscription service which lowers the upfront cost of adoption. Price is a major part of why 53% of data-driven enterprises use cloud analytics. It has to be said: in the past collecting and aggregating data didn’t live up to the hype. When the Big Data craze was at its height promoters promised huge profits that never materialized. As a result barely half of CIOs now believe they have the ability to generate any sort of meaningful business insights from their data. The majority say they’ve experienced a failed Big Data project that soured them on further data science initiatives. Big Data may have taken all the blame, but to be fair over 88% of projects failed because of addressable issues. Low end user adoption, unresolved conflicts with existing technology, and budgeting problems have more to do with poor management than immature technology. Also, Big Data and data science are not the same thing. Having a failed Big Data project does not imply someone will have a negative experience with data science in general. Big Data refers to the concept of having enormous stores of structured and unstructured data on a scale that can’t be easily processed by traditional manual methods. Data science is an interdisciplinary field encompassing a variety of scientific methods and technologies used to draw complex insights from any kind of data. Machine learning falls under data science, for example. Solution: Good project management is key to successful data science initiatives. Carefully controlling the process from the first requirements gathering phase to the final sprint can create a solution which increases end user adoption and meets the specific needs of a company, including consideration of existing technology. Once CIOs begin seriously considering data science they encounter another hurdle. Data science and artificial intelligence companies are hard to find. Rather, they’re easy to find but notoriously unreliable. “There are probably 100 or more [machine-learning companies] out there,” said Richard Sherlund of Barclays. “They’re just so small, you know? You’ve got half a dozen or a dozen data scientists that get together, and [the companies are] for sale now at $100 to $200 million. You buy it, and then they leave, you’re kind of hosed.” Losing a contractor is always a risk of software development. It’s one of the major reasons given when companies won’t hire offshore developers. The impact is felt a little more keenly in data science projects, which are more heavily composed of custom code that’s hard for “pinch hitter” developers to take over. Solution: Most companies don’t need a specialized machine learning contractor. All but the most individual needs can be handled by a web development who’s able to create the custom analytics dashboards mentioned above. That’s a tricky process, but much easier and cheaper than building and training a machine learning engine from scratch. CIOs who choose this approach can use normal evaluation criteria such as reputation and portfolio to assess potential development partners. There’s no turning back the technology clock. With data rapidly becoming as valuable as oil or gold, companies who don’t learn to exploit theirs will soon be outcompeted. CIOs need to take a hard look at what’s holding them back and find a way to overcome their hesitations before their company is left in the metaphorical dust. Interested in data science, but not sure where to start? Skeptical about how useful AI actually is for enterprise? Wondering how to make a business case for integrating machine learning and artificial intelligence into your company’s decision-making cycle? 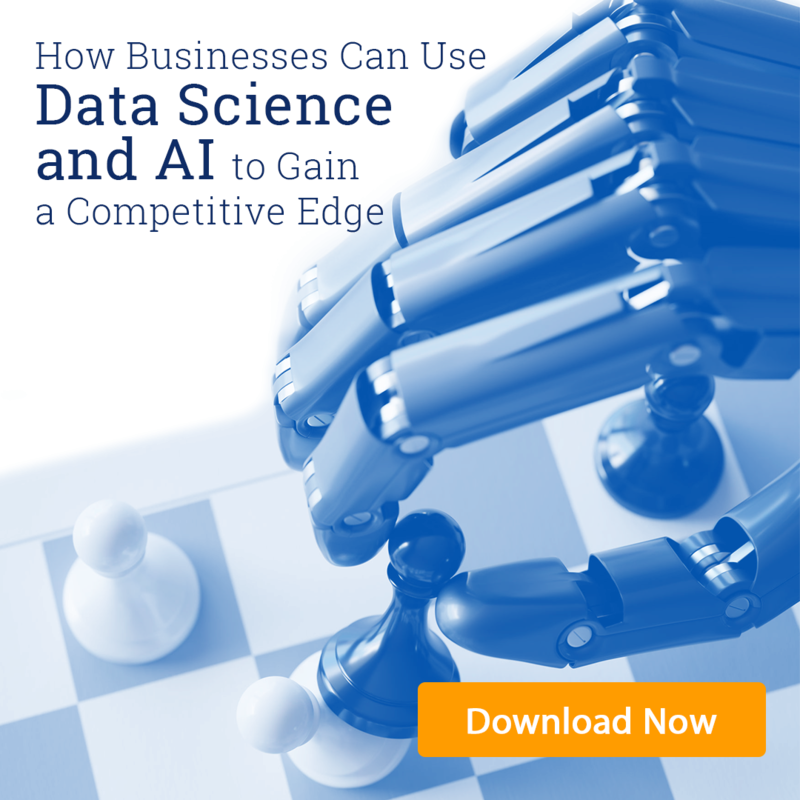 Concepta’s new report “From Data to Decisions: How Businesses Can Gain a Competitive Edge from Artificial Intelligence” has the answers you need! This free downloadable resource provides an in-depth look at how data science AI technology is being used by businesses to improve workflow, minimize waste, increase customer satisfaction, and plan for the future.